In the heart of Fort-de-France, the Empress puts at your disposal its 4 privatized spaces for all your events, professional or private. Conference, seminar, meeting, working breakfast, cocktail, group meal, banquet, birthday … our rooms adapt to all your receptions. All our rooms can be equipped with video projector, screen, microphone, paper board and can adapt to the specificity of your request. To enhance your work sessions, do not hesitate to contact us for the organization of your coffee breaks, aperitifs, group meals or cocktails. We will propose a personalized solution according to your expectations and your budget. 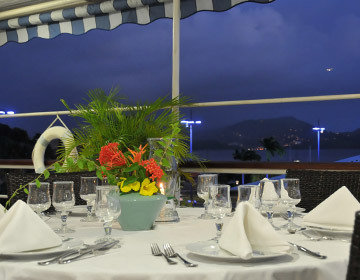 On the fourth floor of the hotel, the Club’s terrace is a covered open-air space overlooking the city and enjoys a breathtaking view of the Savannah Park, the Flamands Bay and the roofs of Fort-de-France. This modular space is ideal for your conferences, banquets and cocktails. 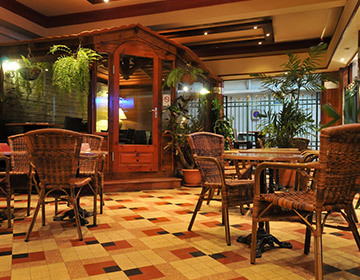 Located on the first floor, the Celadon Lounge is an elegant and intimate air-conditioned space. 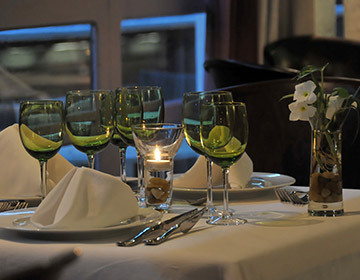 It is ideal for meetings or quality meals in small groups. 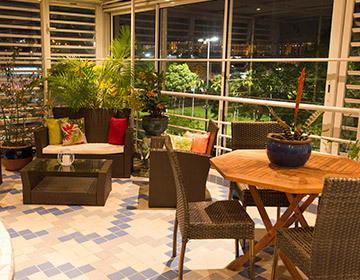 The Terrasse Fernande is a covered terrace located on the 4th floor, with a magnificent view of the Savannah Park. This floral and green living room is ideal for meals up to 12 people in a bucolic atmosphere. Kiosk Khokho is a small air conditioned lounge located on the ground floor in the cafe. It is ideal for meetings and small group work sessions, lunches or work-friendly breakfasts.